Not every corpse you see is guaranteed to be a zombie, or even a slain zombie. Some, like this Leaning Impaled Farmer Victim, are just unfortunate victims who died in the fight against and inevitable flight from the approaching zombie hordes. Although, one can only wonder at what happened to cause this poor farmers death. This poor farmer must have been the unintended target of a badly thrown hay fork, given that the implement is now impaled through the back of the farmers head and acts as the stand that now holds the body up. This corpse has a dried, green complexion, indicating that it has been some time since the farmer died and has now started to decay. Blood stains the front of the corpses face, while its lips have shrunk and receded, revealing the yellowing teeth. Two metal spikes protrude from the eyes, causing the eyeballs to be plucked right out of their sockets. Blood also stains the farmers dirty blue overalls and its tattered, yellow and blue plaid shirt. 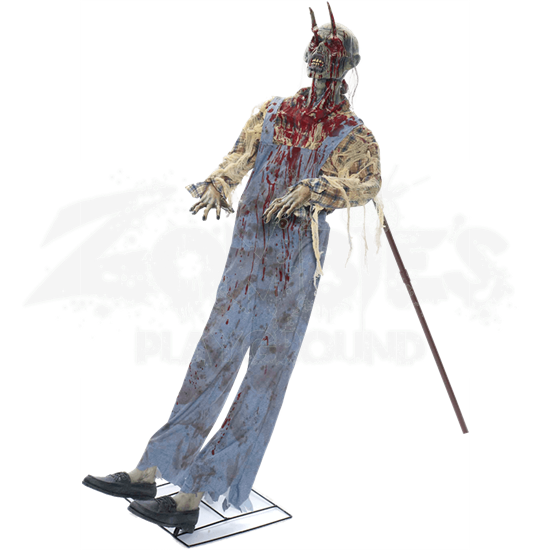 This prop is quite sturdy, featuring a stand under the zombies feet that provides a stable base, as well as a solid pitch fork that the zombie leans back on. The decorations arms are pose-able. Some assembly is required to put this prop up. 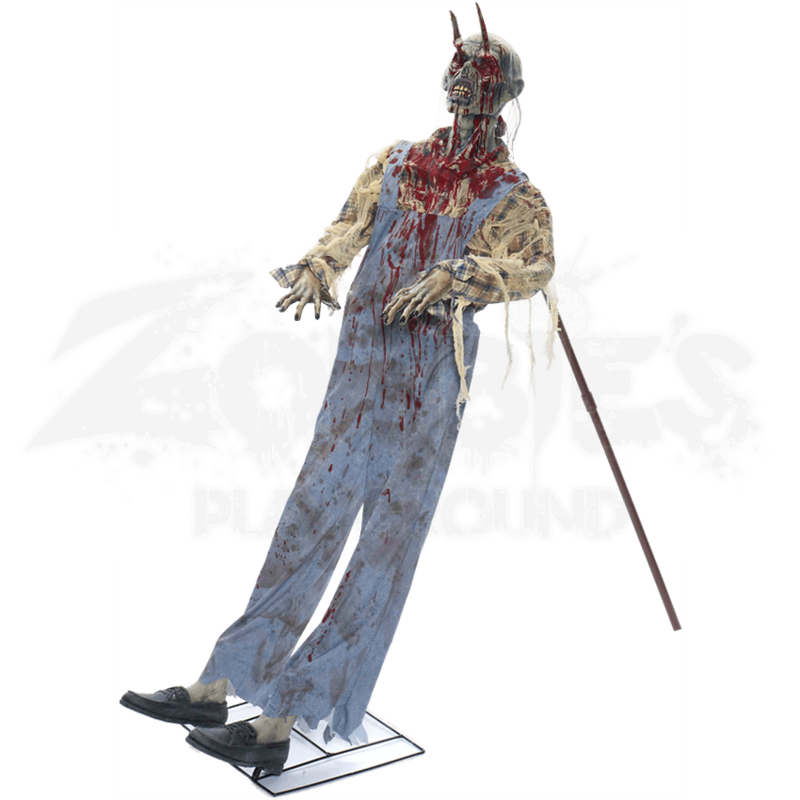 As unfortunate as its circumstances are, the Leaning Impaled Farmer Victim makes a great decoration for your Halloween arrangement, especially if other bodies or zombies are included, and it also makes a great greeter for any creepy party that might meet up in the out in the country.